Around the country, bartenders are putting their own spin on the classic Mexican beer cocktail, and we've got recipes. A F&W Best New Chef alum is serving elevated micheladas at his Southern California restaurant. There's a house michelada on the menu at a top cocktail bar in Houston. San Antonio now boasts multiple michelada festivals, one with multiple food trucks each making their own version of the classic beer cocktail from Mexico. It's safe to say, the humble michelada, which for many people is just your basic lager with the addition of tomato juice and a dash of hot sauce, is not so much having a moment as it is here to stay. Unlike many other cocktails, where precision is key and tradition dictates the rules, what a michelada is depends on who you're talking to, and where that person is talking to you from. Whether or not they're from (or in) Mexico will not really help you, with different regions each having their own ideas about what exactly a real michelada is made of. Out of all this confusion, however, comes opportunity—from coast to coast, bartenders, chefs and pretty much everyone else who likes to mix a drink now and then has come up with their own concepts of what a michelada should look and taste like; some establishments (particularly in the parts of Texas and Southern California where michelada-friendly weather never seems to be more than a day or two away) now even have michelada menus, with multiple, competing varieties all coming from out behind the same bar. Want to get in on the fun? Upgrade your weekend micheladas (if you didn't know already, they're a great brunch alternative to the bloody mary) with these two recipes, from two of the most acclaimed bars in Texas. At Houston's fun, craft-beer focused sibling to James Beard Award winner Chris Shepherd's Underbelly, spirits director Westin Galleymore's personal love of micheladas led to this unique recipe that brings fish sauce and shrimp paste into the mix. "Some micheladas can be over the top with heat and acid which will set you up for disaster if you're trying to cure a hangover or deciding to call it a night. I personally love this recipe because it hits the right notes of heat and acid while not tasting solely like tomato juice. There is a savoriness that comes through with the fish sauce and shrimp paste that isn't just salt. Hold all the fancy garnishes and just serve with a pickled green bean, an olive and a slice of lime." Rim a pint glass with salt and pepper. Add Michelada mix and Tabasco to a pint glass filled with ice. Top with Firestone Walker 805. Bobby Heugel and Alba Huerta's award-winning downtown cocktail bar is another Houston gem; here, they recommend the michelada as a sidecar to a shot of mezcal or tequila; they even offer a combo pairing. 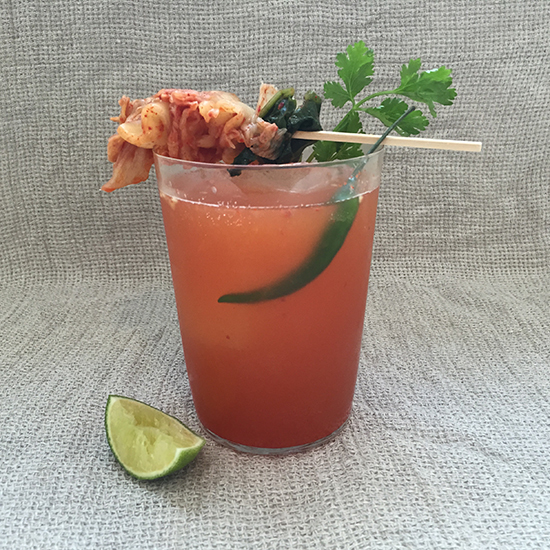 "Our michelada mix was meticulously crafted over the years to its current recipe," says General Manager Sarah Cuneo. "This mix, combined with the ratio of mix to beer and the chile pequin salted rim really completes the drink." Rim a pint glass with chili pequin salt. Squeeze half a lime into glass and put expressed lime into the glass. Combine all ingredients in a blender and store. If you'd rather have someone else do the heavy lifting, that's totally fine, as well—these days, you're never far from a brunch spot serving their own interpretation of the drink; here are just a few of the more celebrated, classed-up micheladas on the menu right now. At this classed-up brewpub in the city's so-hot-right-now Pearl District, a chef-driven michelada marries a complex mix that brings everything from horseradish, celery, Maggi seasoning and lime juice together with the brewery's fascinating tomato gose. Talk about liquid brunch. Of the many little surprises this San Fernando Valley standout yields, their Easy Like Sunday Michelada has quickly become a brunch classic; here, the usual tomato and lime are joined by a housemade carrot-habanero hot sauce and, apparently, a dash of A1, for a bold twist; you can add a float of house-infused habanero vodka, if you like, to really take things over the top. The ceaselessly-cool South Congress spot is home to one of Austin's most iconic micheladas, which skips the tomato element, instead going for soy, Worcestershire, Tabasco, lime juice and black pepper, all paired with a classic Mexican beer. It's the perfect thing for those warm days by the hotel's see-and-be-seen pool.